When it comes to Fire and Gas Detection design and mapping, compliance is critical. Navigating through the nuances of differing design standards while carrying out mapping studies can often be a challenging task and that is exactly why we believe competence and training are crucial. 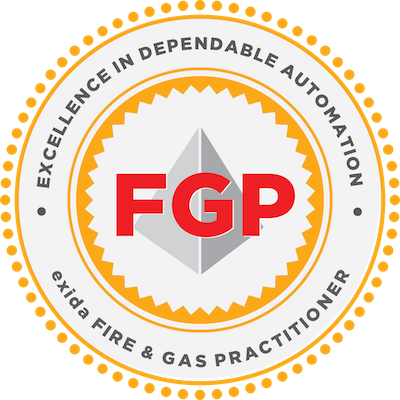 The FGP course offers a globally recognized and independently certified training course which will result in a certification of competence in Fire and Gas Detection Technology, Design and Mapping. The course consists of a training course and an optional exam set by 3rd party examination and certification body, exida. Upon passing the exam, participants shall be awarded with a 3rd party certificate of competence in F&G Mapping, which is crucial in demonstrating competence in the design of F&G Detection systems. This exam is entirely independent of the training provider. and as such carries unique credibility in demonstrating competence. exida Examination will take place immediately after completion of training course. If successful, the delegate will be presented with an exida Certificate of Competence for Fire and Gas Detection Design, Technology and Mapping. 3rd Party certified and accredited examination from exida, the global leaders in functional safety. This certification will enable all delegates to demonstrate competence in fire and gas mapping and technology. All delegates will be trained in the full use of Fire and Gas Mapping software per the training provider. The academic teaching is critical in the FGP program, however, so is practical fire demonstrations and hands on tasks with gas detection to affirm the knowledge gained in the classroom. Note that some training courses include this type of hands on demonstrations. Well tailored training course with frequent references to engineering technical practices. This helped me better understand the thinking behind some of the requirements and how to apply in practice. exida would like to congratulate the latest FGPs!